You may use services such as Western Union or MoneyGram or other electronic payment services to take your payment and provide it to us within one business day, eliminating the payment hold of up to fourteen days. Bring a copy of your First Access Card statement to provide the payee name (“First Access Card”), your account number, and the remittance address. Please note that the electronic payment service provider may charge a fee for this service. 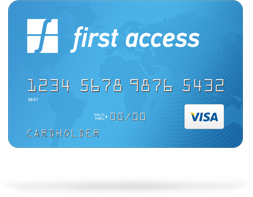 This fee is not paid to First Access Card; please check with the provider for details. The information described in this website is accurate as of the date you accessed it. fuel pumps, for gambling transactions or at merchants outside the United States. Click below to visit myccpay.com, where you can see your First Access Card account details and make payments to your account. Mail us a check or money order, accompanied by the remittance coupon from your billing statement, to PO Box 5220, Sioux Falls, SD 57117-5220. Note that payments not made in guaranteed funds may not create available credit for up to fourteen (14) days to allow the payment to clear or even longer if circumstances warrant an additional hold. Guaranteed funds include payments in the form of money orders, cashier’s checks, and Western Union and MoneyGram payments. Please see your cardholder agreement for additional payment information. You’ve chosen a great credit card, but your application is not yet complete. You can click below to complete the process now, or return later at a more convenient time. You can also bookmark this page and return later, or click below and we will send a reference email that you can use to return at your convenience. 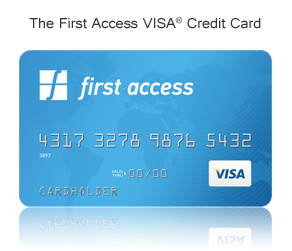 Your application has been approved and your new First Access VISA Card is on the way. In order to activate your account you must pay the $89 Program Fee. If you pay the fee now, your card can be activated immediately upon receipt. Thank you for becoming a cardmember!